The AKT-180-M Solar Panel is an excellent panel for people looking for a simple way to enter the world of free solar power. This large 12 volt, 180 watt monocrystalline solar panel is water resistant and sealed against the elements making it ideal for use on a roof or in the garden to provide free solar power for powering the home or as part of an “off-grid” solar system for a shed or outhouse that is not connected directly to the utility grid. What makes this AKT 180W Solar Panel perfect for home use is that it is made using 72 long-lasting, high-efficiency, 125mm x 125mm monocrystalline photovoltaic cells arranged into a 12×3 + 12×3 configuration designed to give a full 180 watts of free solar power. 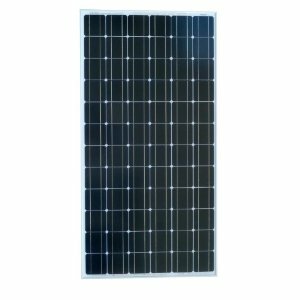 In addition, this 180W Mono-crystalline Solar Panel comes complete with 5m of high-current solar cable and industry standard MC4 connectors. It also comes with a fully waterproof junction box allowing you to connect it with other 180 watt solar panels to create larger roof mounted solar arrays. This panel is a top-quality solar panels which has a 5 years product warranty and guarantees over 10 years for 90% power and 80% of full power after 20 years of continuous use with some of the highest solar cell efficiencies, around 17%, in the marketplace, all at affordable prices. You will find this 180 watt solar panel cheapest on sale at Amazon through this link right here. This 180 watt, 12 volt solar panel is ideal for use in powering ON or OFF grid solar power systems and with the aid of a charge controller for charging deep cycle batteries. It’s rigid anodised aluminium frame and toughened 3.2mm tempered glass prevents damage due to frost, snow and high winds giving it a design life of over 25 years of consistent free power mounted to a roof. The AKT-180-M Solar Panel has bypass diodes fitted to avoid any hot-spot effects making it perfect for placing in series with other panels to create larger roof mounted solar arrays. The backside of the panels frame is equipped with drainage holes in order to eliminate the risk that rain or snow water may accumulate in the frame causing damage to the frame in cold season. Top of the range 180 Watt Solar Panel with excellent performance. Weatherproof and durable, perfect for permanent outdoor use on a roof or in a garden. Complete with 5m of flexible solar cable and MC4 connectors. Higher cost per watt compared to similar sized panels. Requires additional roof mounting holes and/or brackets. This 180 watt solar panel is currently on sale on Amazon through this link right here. This high quality waterproof 180 watt solar panel is ideal for people who want to save money on their electricity bills and the environment, or where it would cost too much to install electrical cables to a shed or outhouse. The 180 watt panel is powerful enough to be used to power hundreds of devices that you may use in a shed, boat or caravan such as lights and pumps and will even generate free renewable solar power on a cloudy day. Due to its stable, heavy duty anodised aluminium alloy frame and 3.2mm thick high-transparent glass gives it exceptional strength, making this solar panel perfect for permanent outdoor use on a roof or in the garden to provide free solar power. Also, the low-iron tempered anti-reflecting glass helps to increase the solar conversion efficiency of the panel and reduce overheating by direct exposure to the suns rays. For off-grid charging of batteries as in a caravan, camper van, boat or remote house type applications, why not connect the 180W AKT Solar Panel together with other 180W AKT solar panels to form larger arrays of many kilo-watts producing a higher voltage or greater battery charging current. The following table gives you an idea of what is possible with this versatile 180W, 12V panel. Note that the AKT-140-M solar panel can be connected together in either a series, parallel or a combination of both to give a higher output voltage or charging current from the array than a single panel. For example, 4 off AKT-140-M solar panels panels connected in series would give maximum operating voltage 70 volts (4 x 17.5) at 10.29 amps ( Vmp x Imp = 70 x 10.29 = 720W ). Likewise, 4 off AKT-140-M solar panels connected together in parallel would give 17.5 volts at 41.2 amps ( Vmp x Imp = 17.5 x 41.2 = 720W ). It is always better for circuit design and installation to connect together high wattage solar panels such as this AKT-140-M to give a higher voltage and lower current configuration. Solar charge controllers allow the configuration of solar arrays with high open circuit voltages (Voc) and may thousands of watts. The Outback FLEXmax FM80 is a powerful charge controller capable of operating at its full maximum current rating of 80 Amps. The 80A charge controller uses Maximum Power Point Tracking (MPPT) technology with adjustable current limiting to extend the life of the connected batteries. This 80A Charge Controller can work with sealed, gel and lead-acid battery banks. The controller supports a wide range of nominal battery voltages from 12V to 60VDC and has the ability to step-down a higher voltage solar array to recharge a lower voltage battery bank. A built-in, backlit 80 character display shows the current status and logged system performance data for the last 128 days at the touch of a button. As with all the solar panels from AKT, it complies with IEC 61215 and IEC 61730 standards assuring the quality of the panel, so for more information, customer reviews about this 180W monocrystalline solar panel, Click Here to visit Amazon, you won’t find it cheaper anywhere else. Free shipping is also included. Good day I am interested in a system for borewell project. To power 1 12hp pump for irrigation through solar PV in daytime only. – Thanks. Appreciative of your attention.